The following document shares the petitions President Cornwell received for and against evangelical Christian organization, Cru, becoming a registered student organization. The Sandspur did not make any edits to their content. President Cornwell received over 230 letters via email, formatted and written as seen below, from people asking him to uphold the current non-discrimination policy and to not allow Cru or InterVarsity to become a student organization. The letters were sent via Action Network, an automated system, and the account was created by Kalli Joslin (‘19) and Sianna Boschetti (‘18). 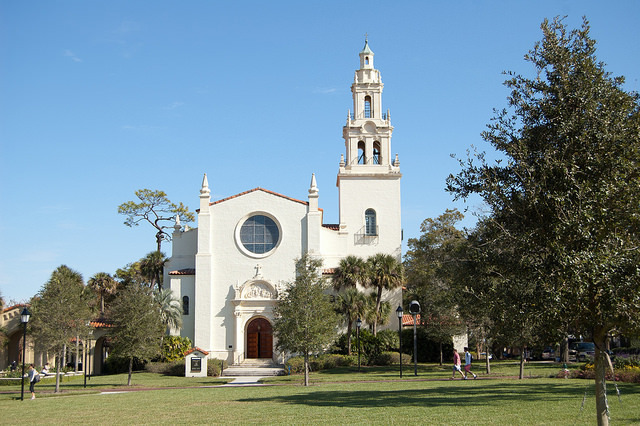 The current Rollins College non-discrimination policy was upheld by the Board of Trustees in 2013 when evangelical Christian organization InterVarsity was removed from campus for discriminating against an LGBTQ student faith leader. Now, you are considering allowing Cru at Rollins despite the fact that they are unwilling to abide by the Rollins non-discrimination policy that every other organization at Rollins supports. As in the InterVarsity case, allowing Cru on campus would directly threaten the rights of LGBTQ students who wish to practice their faith. Changing our non-discrimination policy also paves the way for future discrimination at Rollins—if you would allow an exemption for Cru, what other kinds of discrimination would follow? In The Sandspur article published on September 20, 2018, you stated that “it does trouble me that we have groups of Christian students who want to identify as such and pursue the study of their faith but that they have to do so off-campus because we don’t formally recognize their organization.” That statement disregards the fact that three Christian organizations already exist at Rollins and follow the non-discrimination policy: Leaders United in Christ (LUX), Every Nation Campus Ministry, and Rollins Catholic Campus Ministry. If Cru is recognized as an official student organization despite this fact, Rollins College would be directly funding discrimination on its campus when these students already have a multitude of communities open to them. As a member of the Rollins community and a concerned global citizen, I urge you to please support our nondiscrimination policy and our mission statement by directly encouraging “opportunities to explore diverse intellectual, spiritual, and aesthetic traditions,” “responsible leadership,” “social responsibility,” and a “healthy, responsive, and inclusive environment.” Please say NO to Cru, and say NO to discrimination. The following petition in support of Cru and InterVarsity was sent to President Grant Cornwell on Sept. 25. The petition had 119 names attached representing people who stand with the statement. Student members of Cru would not disclose who started the petition. For many, Rollins is a home, a safe haven chosen by a wonderfully diverse population of aspiring scholars. Students have adopted this community as a place to explore the world around them, while resting in knowledge that the College is committed to supporting them in those things around which they build their unique identities. A crucial part of the College has been the allowance of students to express their full identity through organizations and outlets on campus. Regrettably, this has not been the case at Rollins. Many feel as if they have not been able to express themselves wholly, especially in the light of the dismissal and continued denial of several Christian ministries to have a place on campus. While Rollins has a host of student organizations that reflect a wide variety of identities, from ethnicities to athletics to academic interests and many more, the rejection of evangelical groups, specifically interVarsity Christian Fellowship and Cru, has made us feel that we cannot rightly call Rollins an all-inclusive campus. That all persons, including the LGBTQ community and those of worldviews or faith traditions different from our own, are made in the image of God (Genesis 1:26-27) and are worthy of dignity, respect, love, and flourishing, and that the Christian community is bound by Scripture to work to see the flourishing of all their neighbors (Luke 10:25-37, Jeremiah 29:4-7). That evangelical groups such as InterVarsity Christian Fellowship and Cru should have a place on campus to represent our evangelical population; to not have a place where students of faith can call home to Rollins and express our identity to full capability, is to ultimately fail at our institutional mission of forming responsible leaders and global citizens. That the current “all comers” policy of the college fails to accommodate religious organizations. We believe that any and all should be welcomed to actively participate in religious organizations, but that these organizations should rightfully be able to select leaders who align with their doctrines and practices of their particular faith tradition. That, for students who align with theological tradition of ministries such as InterVarsity and Cru, the selection of leaders can only take place within the context of biblical criteria of candidacy (e.g. 1 Timothy 3). As these criteria are sincerely believed to be authored under the divine inspiration of God (2 Timothy 3:16); these convictions regarding leadership are an inviolable cornerstone of evangelical belief and practice. That religious groups, evangelical and otherwise, should be granted provisions that allow them to utilize religious/doctrinal/theological criteria in the selection and maintenance of leadership; this both preserves the mission of the group while maintaining integrity of the organization. Students can expect that leaders within particular faith tradition will actually represent that tradition. That until such provisions are allowed, any evangelical Christian group, or any other religious group, is welcomed on campus in word only. Instating a religious group on campus with the conditions that they can be kicked off at any time for selecting leaders in line with their mission and doctrines if ultimately setting these groups up for failure. In response to these affirmations, we the undersigned ask that the appropriate parties, be they yourself or the Board of Trustees, take action to grant the provisions described in order to create a campus that is truly inclusive of its religious populations. We thank you for your time and your consideration.